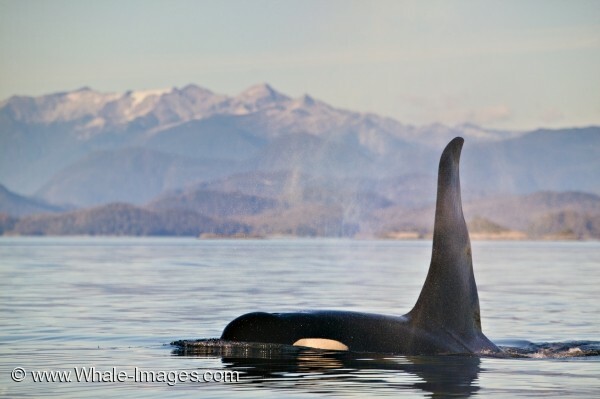 Photo of a large male Killer Whale sourrouded by beautiful scenery. Taken late in the afternoon as the sun was sinking low in the sky, this photo of a killer whale (Blackney, A 38) has the British Columbia Coastal mountains lightly sprinkled with snow, and lush forested islands as a backdrop. This large male orca whale was just cruising through the calm waters of the Queen Charlotte Strait, surrounded by this stunning scenery - a calm and relaxing sight - a beautiful photo of a Killer Whale!